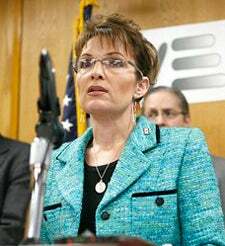 Sarah Palin is not only reportedly shopping a book proposal, but the Alaska governor has been taking to the airwaves to decry the media coverage of her family as unfair. Oh, brother. Look, I am firmly on the record as against much of the politically-tinged coverage of Palin's family and of the worst of the Palin name-calling from the left. On the other hand, "the bloggers" who keep harping on Trig's parentage amount to one — the Atlantic's Andrew Sullivan — who's pretty much stopped talking about it at this point. Plenty of people on both sides of the aisle have stood up for Palin and for her family and, for the most part, the worst thing anyone has said is that Bristol and Levi appeared, for all intents and purposes, to have dropped out of high school since no one had heard anything about them getting their GEDs (which, technically, means that they are working toward diplomas and not that they are still enrolled in high school, but...details). So, while I agree that her kids should stop being fodder for political attacks, I'm more than a little sick of this whole pity party Palin is trying to keep going to promote herself, her political ambitions, her potential book and to extend her time in the public spotlight. That said, if we don't want the right-wing press to do it to Sasha and Malia — or if we plan on non-hypocritically decrying it — those of us on the left probably ought to stop using the excuse that she's putting them into the spotlight, lest we have to explain why the school pictures of the Obama girls, the Kids Concert with their favorite band and the details given to the press of their Inauguration Night sleepover and scavenger hunt isn't "putting them into the spotlight."